Bush Point was originally named “Willow Point,” and it was once the perfect location for human trafficking operations (predominantly Chinese labor), illegal rum smuggling and native potlatch houses. This pile of sand nestled strategically against the western shore of Whidbey Island came into the possession of the first white settlers by being won in a poker game. Sadly, the Snohomish Indians were displaced by the tides of westward migration. Originally, they had a Potlatch house, three long houses, a few private dwellings and a cemetery. 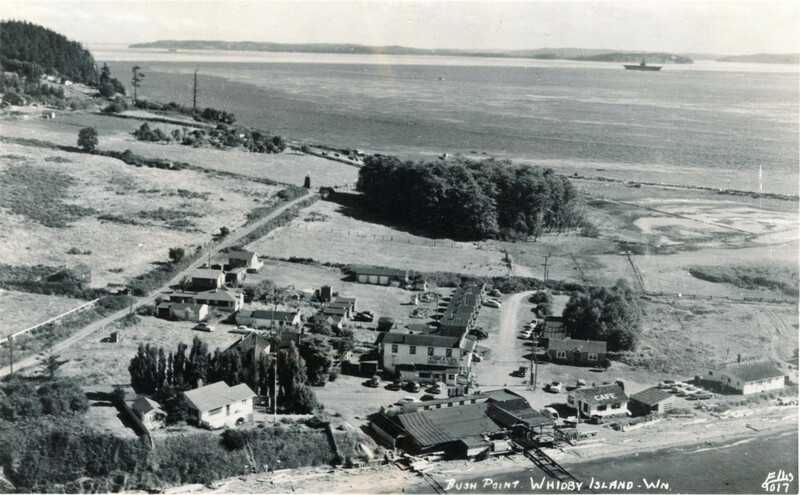 Willow Point represented one of the three permanent villages the Snohomish had on Whidbey Island. The first caucasian settler at Bush Point was in 1865. In 1865, approximately five years after Nathaniel Porter settled in at Mutiny Bay, 37-year-old Andrew Deming arrived from Vermont and settled just north of the Porter’s at Bush Point. In 1875, he married a fifteen-year-old native girl, Catterina, and started a family. Deming had created a thriving farm with a home-made baler. He shipped his hay to Port Townsend and Port Ludlow. The home he built for Catterina, and the five children she would bear him, was constructed with wood dowel joints and square nails which Deming had hand-cut. Perhaps the most intriguing, as well as colorful figures linked to Bush Point was the Danish sea captain, Christian Madsen. Madsen was born in Denmark in 1837, and from an early age, he was destined for the sea. By 1857, he was a clipper ship owner and sailed around the horn to San Francisco. Shrewdly perceiving an opportunity in the construction boom occurring in San Francisco, he established his business headquarters in San Francisco and executed his timber business on Whidbey Island and the Olympic Peninsula. Residents of Mutiny Bay and Useless Bay grew familiar to the site of Madsen’s timber transport ships, Thatcher, H.C.Page and Letitia. As oral tradition has it, Madsen was an experienced poker player. In one such game in Port Townsend, he placed his ante in the pot for $1,500 and won the whole pot. The loser, a soldier (name not known) could not satisfy his debt, and had to do so by transfer of a deed to all real property identified as “Willow Point.” Madsen may have experienced a full life of business speculation and life threatening sea conditions, but he also knew how to manage risk. In 1881, Madsen submitted the soldier’s quit claim deed and had a “pre-emption” claim filed and recorded in the county courthouse. It was about 1870 when Christian Madsen began to lead a double-life. In public, Madsen was a confirmed bachelor, but in private, he had a wife, three step-children, a small farm at Bush Point and went by the name “Jim Brown.” Until Madsen came along, the widow Emily Low was a Clallam native who had been married to a white settler and had three children. Eventually, Madsen constructed a small cottage at Bush Point and moved Emily and the children there. He retired from shipping shortly thereafter, took up farming full time and no longer made a secret of being married. The story of the Farmers at Bush Point begins with Christian Madsen in San Francisco in 1857. John Curtis Farmer was an Englishman who immigrated to the United States sometime before 1847 when his first son, Frank, was born. Madsen and Farmer met in San Francisco where they discovered they had much in common. They were both about the same age, both had some college or university training and finally, they both exhibited an eagerness and talent for business. Farmer wanted to prosper by filling San Francisco’s growing need for construction lumber and dock pilings. He had several peninsula locations in mind for lumber producing sawmills, to create a hub for distribution and shipping to San Francisco. Christian Madsen could supply the ships. As the business relationship developed, so did the destiny of both families. Once the quit claim deed for Willow Point was filed with the county, the future became crystal clear to Christian Madsen. In that future he envisioned escape from leading an awkward, double life, retirement from the shipping industry, and ultimately, living his remaining years as a gentleman farmer on Whidbey Island. It was a natural consequence that Christian Madsen almost begged J. Curtis Farmer to move up to Whidbey Island to construct the warehouse and cottage on the spit of land he had acquired in a poker game. Farmer had been teaching his second son, John Carlton Farmer, the business operations from their headquarters in San Francisco. Then it happened. It was 1880 and the Farmers and the Madsens were in full swing constructing the warehouse and cottage when young Minnie Low Madsen caught young 20-year-old John Carlton Farmer’s eye. They were married in 1883. According to oral tradition, Minnie decided she and her new husband should become property owners. She took her step-father up to the courthouse, plunked down $100 in gold coin, and requested the deed be transferred to “Minnie Farmer” for sixty-six and a half acres of the Willow Point property – originally won in a card game. Minnie and J. Carlton Farmer thrived on the west side of Whidbey Island at Bush Point. They purchased Holstein cows, they had to build a larger barn, they planted a fruit orchard, then a vegetable garden, and of course, lots of chickens for eggs and eating. Ultimately they opened a store. In fact, the Farmers were so productive, they had to build a 24-foot sailboat (christened “The Egg Box”) to ferry eggs, milk, butter, fruits, vegetables and meats to the passenger vessels and cargo freighters lining up off Bush Point. J. Curtis Farmer’s dream of a prosperous future for the Farmer clan was realized for several years at Willow Point. J. Carlton Farmer was widowed at 37 years of age when Minnie died; he never remarried*. (*per phone con with Darla Farmer of Dec 3, 2015).